Itema America, Inc., with headquarters in Spartanburg, SC, is the result of the successful merger in the early 2000 of two renowned weaving machines manufacturers, Sulzer (founded in 1834 in Switzerland that opened the US subsidiary in 1964) and Somet (founded in 1967 in Italy that opened the affiliate - Somet of America - in 1982). In fact, Customer support is well recognized and it is the pride of Itema America Inc., where highly skilled and experienced weaving technicians and textile experts are on call to ensure a quick and personalized after-sales support to the wide base of Itema Customers. The Itema America team works relentlessly side by side with its American Customers, offering expert advice and service, unwavering support, and unmatched dedication. Itema America provides extensive training courses at its premises and/or on-site at Customer mills and, additionally, the Company offers electronic and mechanical services and repairs, as well as timely and reliable spare parts deliveries and upgrade kits. In recent years Itema further reinforced its traditional leadership in the American market, where the company advanced weaving technology is increasingly appreciated for a wide range of applications, from technical fabrics to furnishing and passing through apparel and home textile fabrics. The latest Itema machine models – the rapier R9500 (today available in its second generation offering superior energy savings and higher performances than ever before) and the airjet A9500p with its real time filling insertion and best in class air-consumption– have quickly become the machines of choice for many US weavers. Both Customers’ satisfaction and Itema machines installed base are increasingly growing leading to extremely positive results for Itema in the American market. As a matter of fact, in 2018 Itema America sold more airjet weaving machines in the US market than anybody else. During Techtextil North America, Itema America team will concentrate in showcasing the company strong offering for technical fabrics weavers. Itema is uniquely positioned to offer technical textile manufacturers the top three weft insertion technologies - Rapier, Airjet and Projectile, in what is the most comprehensive portfolio on the market today for technical applications. The rapier R95002 is by far the most successful rapier loom in recent history. 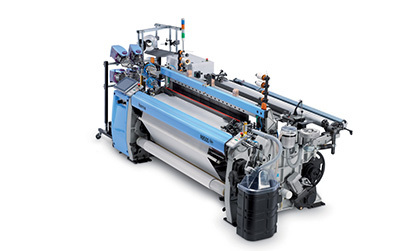 The continuous roll-out of customized special versions tailored for technical applications, including OPW Airbag, Fiber Glass, Bolting Cloth, among others, the wide weaving width up to 540 cm, as well as new and advanced devices make the R95002 by Itema the perfect machine to weave the full range of technical textiles, including ones with the finest monofilament, multifilament high tenacity yarns, and multiple pick insertion fabrics. Looking at specific technical applications the airjet A9500p – the most innovative airjet weaving machine in the market – provides undeniable benefits, matching unparalleled performances and the highest productivity with superior textile efficiency and has already amassed important references, especially in medical applications and automotive fabrics. The Itema A9500p is pre-set for independent motorized Jacquard with no cardan shaft, allowing to weave specific technical textiles (such as Airbag OPW) with no speed limitations. When it comes to weaving very high density fabrics, the A9500p is customized with dedicated devices to ensure best possible results. Key components are reinforced to ensure optimized machine control and reliability whilst Itema patented devices guarantee reduced air and energy consumption and superior textile efficiency. Technical fabrics are the specialty of the legendary and unique projectile P7300HP due to the unparalleled versatility and reliability of its weft insertion system. The unmatchable uniqueness of the positive weft transfer consists in the single insertion driven by the projectile, which catches the weft and carries it directly with no exchanges, providing unmatched efficiency. The P7300HP continues to harness great interest from projectile weaving aficionados and represents an unbeaten and unbeatable benchmark for those looking to weave the widest fabrics - up to 655cm weaving width - and high-specialty materials, such as agrotextile, geotextile and carpet backing. When it comes to weaving tape yarns, the Itema projectile weaving machine provides the highest performance compared to all the other insertion technologies currently available on the market.